Our first interview with Ada Mama! 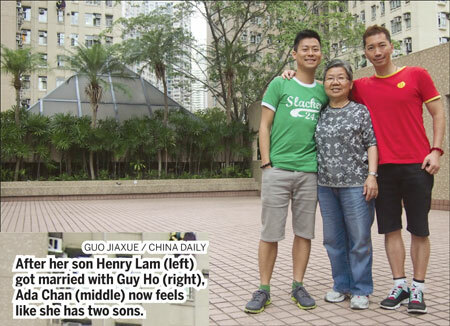 So glad we got the chance to be interviewed by China Daily, as they needed a story of family with gay members – and now our family has two! It was my mother’s first interview with the media and I was worried that she might not feel comfortable to do it, but she said if we could help some people out by doing this, then go ahead! I was so moved when she told me this since she was rather closeted like I was before whenever in public. The reporter was shocked when she found out my mother is already at her late 60s! She was so friendly and truly happy for our relationship when we told her our story. Mom was then relaxed and talked to her like a good friend. Hopefully more people will be aware of the need of family support to their gay children. 又一活証, 母愛的偉大與無私, 寄語那些口裹說愛, 卻正在逼迫子女, 去follow自己一套的父母, 平心而想, 什麽才謂”愛”.